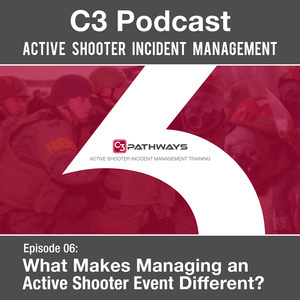 Episode 06: What Makes Managing an Active Shooter Event Different? Hello, and welcome to the discussion this afternoon. Today we are going to talk about what makes managing active shooter events different from all of the other types of incidents that responders go to. Today, we have with us Adam Pendley, assistant chief with Jacksonville sheriff's office, Travis Cox, lieutenant with Jacksonville sheriff's office, Tom Billington, retired fire chief, and I'm Bill Godfrey, also retired fire chief. Our topic today, Adam, what do you think sticks out in your mind, makes things different? Well, I think it's a great number of resources that respond very quickly in an active shooter event. While that makes it different than a lot of other types of incidents that you would use, let's say, the Incident Command System to manage, an active shooter event is also the same in the sense that it's very important to focus on the fact that the Incident Command System allows you to build operations quickly from the ground up. It's different than a lot of your day to day incidents in the sense that there's so many resources across the country that have trained to respond to an active shooter event and so many of them are going to arrive so quickly. What can be the same is that you can still use many of the concepts of the Incident Command System if you remember that truly the Incident Command System is designed to build operations from the ground up for an unplanned event and get them in a manageable span of control quickly, set up a Unity of Command quickly, and start acting proactively in a management by objective sort of way to accomplish certain tasks and certain things that need to get done right away on an active shooter event. Travis, what about you? What sticks out in your mind? What makes managing an active shooter event different from all the other stuff you've responded to? Well, there's a couple things that come to mind when you talk about an active shooter event. One of the things is that you're going to have resources like Adam said. You're going to have a lot of resources, not only responding, but they're going to be self-dispatching or they're going to be responding without being sent by a dispatcher. They're going to be self-deploying to this incident and we want them to self-deploy, because we're going to need the resources. But that's something that's different, that doesn't normally happen on the day to day basis. Secondly, you're going to have resources from other agencies that may not normally respond to things in your jurisdiction, but because of the nature of the incident, you may have other police departments, sheriff's office, neighboring counties, other municipalities within your county responding to this incident. You may have airport police. You may have campus police, school board police. You may have a number of different agencies responding to one incident. You have to figure out your interoperability. You have to figure out the different tactics that you may have been trained on to make sure that everybody's functioning off the same page of music. That's one of the things that has to be done. The second thing that comes to mind is in an active shooter event, you have a crime scene. You may also have a Hot Zone where there's still danger there. So you may get a person that has to assume command of that scene without being involved in that scene or not being able to see the scene, so they have to rely on the information that they're given from the officers that are actually inside the crisis site and manning the information they're given via radio or via some other avenue besides being able to be seeing it from ground zero level. So those are the one big things that I see. So Tom, we got a couple of interesting perspectives from the law enforcement guys. You and I are on the fire side. What jumps out at you as the big differences from the fire side of an active shooter? Well, the big difference is, our leadership needs to let control go. You need to make sure you have key people in right positions. They're going to be down, down on the scene in the Warm Area and you have to let them do their jobs. You cannot run this scene from a command post. Most firefighters, that's the way we think. As a battalion chief or a deputy chief, we think about going to the command post and monitoring everything and giving out orders or direction. This is a case where you have to let your people on scene do their jobs. We're fighting the clock. Usually by the time we get in there, hopefully our law enforcement brothers have neutralized the threat and we're going against the clock. Seconds count. It's a little bit different. It's like you said. It's bottom up instead of top down, letting these folks get these patients treated, transported, and to a surgeon as soon as possible. You know, that's exactly what jumps out at me, too, on the fire side is that traditionally, and I'm not sure I ever really realized this when I was still working active duty. But the fire service, the way we managed scenes, it's a very top down driven approach. The first company officer arrives and he might be in command for a couple of minutes and then the battalion chief takes over and they're in charge and they're directing everything from the top down, not just at the strategic level, but in some cases, they're directing tactics. They're directing which door the hose line's going to go to, which side of the building we're going to vent, the window, the roof, whatever the case may be, where we're going to ladder up. It's a very top down driven approach where the incident commander in many cases is directing the resources in a very flat level. So there's no layers. You don't have a bunch of branches and divisions and groups in most of these things. They're directing those Tactical operations. What really caught my attention about the active shooter events, is that that gets us into trouble real quick because we don't see the lay of the land, if you will, to be able to know the right tactics to call out, where the teams should be exactly, what rooms they should operate in. Where's the best place to set a Casualty Collection Point? Where's the best place for the ambulances to go? It would be in, to me, it's kind of the analogy of trying to run a fire the way we normally run the fire, but doing it from two miles away without ever being able to see the building or seeing what's going on. What's different here to me for the fire service, is that we've gotta reverse that process. We have to push the resources Downrange and then let those resources tell us what they need and where they think these things need to go and what needs to happen. We're pushing the resources to them. We're giving them what they need and supporting them in that role more so than telling them how they're going to do it. They're going to tell us how they're going to do it and we've gotta support that to the degree that we can and make that happen. Of course, coming back over to the law enforcement side, sometimes there are issues that come up where the guys Downrange may want to do something that Command or Tactical may say, "That's not a good idea." Right? Am I saying that right, Adam? Is that how you'd put it? Absolutely. I think a lot of stuff is already happening from the law enforcement side by the time fire EMS takes the medical branch role and starts organizing their resources. For example, if all goes well, Contact Teams have started to call injury counts out to their Tactical group supervisor, who is hopefully now working with Triage and eventually a Transport officer as the eyes and ears that are Downrange. What's interesting about this, when you talk about the reversals of what we're used to, if we go to a large structure fire as law enforcement, we have no problem believing that the fire department has Incident Command and we're really just the law enforcement branch being directed by the fire department to say, "Hey, we need a unit on the end of this street to protect our five-inch line. We need a unit over here to keep people from coming Downrange, and also we believe there's some Hazmat involved, so people need to stay upwind." From a law enforcement perspective, we have no problem understanding that we work for the Incident Commander that's the fire department on a large structure fire. For active shooter events, it's actually kind of the reverse. Law enforcement is in command early on and as the fire EMS supervisor arrives, they request the medical branch, and they take direction from law enforcement. They say, "Hey, we have a Casualty Collection Point established at this location. We believe it's safe to go in this location. This area has been established as Warm Zone." And hopefully, as the culture changes, the fire EMS supervisor can understand okay, we're going to take that from Incident Command and we're going to make that work and we're going to use them as the eyes and ears and we're going to trust the people that are already Downrange, that are already accomplishing tasks and we're going to fill in and start doing the lifesaving that needs to happen based on that information. Travis, what do you think? Yeah, that's a great point, Adam. I just feel like this. The bottom line for us here as First Responders on the fire service and the police side, if we're going to save lives, we have to bring our two disciplines together and we have to work together. Communication is vital. There is no way we're going to be as successful as we can be if we're not communicating. Regardless of what patch is on someone's sleeve at these type of incidents, we have to be able to communicate, work together, work in unison to save lives. Because once the shooting stops, we have ... You always hear the cliché, stop the killing, stop the dying. In order to stop the dying, to get the medical services to those folks that need it as quick as possible, we have to have good communication from those that are Downrange, those that are working in the Warm Zone, and those that are in the Command Post. All three of those different entities have to work together, communicate well, effectively, directly, and ensure that information is flowing back and forth up and down the chain of command so we can be successful as responders to save lives. Tom, what's your thoughts on this? We've kind of come full-scale. You and I are both in agreement that we certainly need to shift gears on the fire side and not try to drive it from the top down. But Travis is talking about the integration up and down the food chain. What jumps out at you about that that's maybe different than the way we used to do it 15 years ago or maybe even what most of us expected? What sticks out to you as the important pieces of the integration? Well, I like what Travis said. It doesn't matter what patch you have on your arm. We can help each other out. When we have people bleeding and the threat has been neutralized, getting the law enforcement officers to help with the medical part, like Travis said, very important. And vice versa. If law enforcement needs some assistance with something, radio traffic, delegation of some tasks, if there's fire personnel available, we should be able to provide that to the law enforcement. But the big thing is, we do not want to wait to be on an active shooter to figure this stuff out. This is the stuff that we need to talk about beforehand. We need to train beforehand and work through these issues. Again, I like the patch idea because we're all one team when we get there and we're fighting that clock. So very good points, Travis. What jumps out at me from, and it feels like an eternity ago, but not that long ago we were looking at this a little different. We were trying to integrate really just in the Command Post, relying on Unified Command alone to be the integration piece between our disciplines and we found out, all of us, kind of found out the hard way that while you can make that work, it is not very fast. It's prone to some of the very mistakes and errors that we were talking about of driving things from the top down and forcing some bad Tactical decisions Downrange. What really jumps out to me is the level of integration that it really takes in order to take time off the clock. We always talk about the two things that are going to kill people is the bad guy and the clock. We can put the bad guy down quick, but if we don't get to people and get medical care going, the clock is going to kill them just the same as if we'd left the bad guy up still shooting people. What really struck me, going through this evolution over the years, is the need to integrate really all up and down the food chain, even at the line level. That rescue task force really only works because you've got the law enforcement and the medical guys now in the same team. The law enforcement guys are communicating with Tactical to stay in tune to the picture that's going on and make sure we don't end up bringing the medics into the wrong place and getting them into a Hot Zone when we didn't want to. The medical side, communicating back with Triage, they're all there working face to face Downrange, but they're back-hauling that information up to Tactical Triage, who are then comparing their bigger picture notes because they might be managing multiple contact teams, multiple rescue task forces, and then above them, we've got the integration in the Command Post between medical branch and law enforcement branch. Travis, how does that strike you? What do you see is the critical importance in that integration? Well, that is key like you said, Bill. We have to be able to work together on all levels up and down the chain of command. For law enforcement and our rescue task forces, with our medical folks, when we go into these crisis sites, we have to be able to work together. We have to communicate. We have a built-in redundancy in our communications when we have the two entities working together. Again, it's all about saving lives. At the end of the day, it's about what can we do to work better, work faster in order to save lives of the citizens that live in our jurisdictions. And to add to what Travis is saying, I think the way that happens is again, those first arriving units start forming teams that have a specific task and purpose, if they stay in their lane. On the law enforcement side, you have a Tactical group supervisor that starts applying the strategy. On the fire EMS side, you have a Triage group supervisor that comes down shoulder to shoulder and works at the edge of the Warm Zone to do that actual lifesaving. There are so many other types of resources, so many other officials, elected officials, and other things that are coming, the job of Command where it's different from a lot of your day to day incidents, the job of Command is to now look outward. There are lots of pressures coming from the community from reunification, additional information, the public information side. The Incident Command takes on a new role of having to not only oversee the lifesaving that's happening into the Tactical Triage and Transport level just to ensure that they're hearing certain benchmarks are happening at that level, but also to look outward to constantly think about the things that are going to happen next. Even if your scene is 100% under control, the bad actor or the suspect came from a location. He arrived in a vehicle. There's hospitals that have to be managed. There's a lot of other things that happen. Unfortunately we don't have the luxury for every resource that comes to the scene to all focus on one task of, let's say, that threat that's Downrange. There are too many jobs that need to be done that if you don't parse those out to different teams with a different task and a different span of control, you're going to lose control of your incident right from the start. Yeah, Adam, I couldn't agree with you more. I think you mentioned two things there, the layers of Command, and then the idea of staying in your lane. Really, the structure and the approach we use, what's interesting to me is that a lot of responders that I talk with, they see managing an active shooter event as really kind of the piece of it that's at the Tactical Triage and Transport level, just managing that Downrange piece when there's actually a lot higher level to it. We need the layers to be able to keep our arms around it with Tactical Triage and Transport staying in their lane, doing what they're supposed to do and then Command Post, medical branch, law enforcement branch staying in their lane. Tom, do you see it same way? What are your thoughts about that responsibility of staying in your lane and the consequences of when we drift off a little? Well, staying in your lane's a good analogy. If you have five lanes of traffic and somebody pops in another lane, everything's going to turn into a disaster. Actually, I think on the C3 website, C3 Pathways website, the checklist is available. The checklist, active shooter checklist, is a great tool for staying in your lane. It lays out the responsibilities for each position. You go right down the list, make sure you're doing everything you need to do. As I said earlier, we want to help each other out, but we want to make sure we're doing our function and staying in that lane. When you do that, you're going to beat that clock. We're running against that clock all the time. So very important point that you made about staying in the lane. Yeah, that does really sum it up. It is about not just getting the bad guy, but beating that clock to save lives. We're coming up on the end of our time. You guys have anything else you want to add on this subject? Any other thoughts, Tom? Travis? I'll just say one thing. Integration and working together, the two different disciplines, does not happen automatically. This is something that you have to train, you have to utilize on maybe smaller events to get comfortable with working with the fire service or working with law enforcement. Then if this incident does happen in your jurisdiction, you're just that much better prepared for it. Oh yeah. That's absolutely true. In fact, Travis, why don't you tell everybody who's listening about what you guys did in Jacksonville with your special events and using that as an opportunity to socialize the rescue task force concept and put people together. Sure. We have several large special events that happen in Jacksonville every year. As we prepare for those events, one of the things that we do is we stand up an Incident Management Team to manage those events. But we pair our law enforcement and our fire service together and we develop rescue task forces for those large events. Whether it's a large football game, whether it's a professional game or a college game, we put those responders together so they get used to working, law enforcement and fire service together, and they're working to handle incidents, those small incidents, that one person down, or that small fight they may be to break up on these smaller incidents to get that experience of working together as a rescue task force. Which I just think is a fantastic program. I don't know anybody else that did that. Every chance I get, I tell people about that because I just thought it was such a fantastic way to normalize that role and begin to build those relationships. No, again, I couldn't agree more that this idea of, not only for the special events, which often are planned from the top down, you have that luxury in a special event to put all the pieces in place. But the other way you can practice this is on the slower-moving, unplanned events. If you have a ... law enforcement has come across a meth lab or has come across a suspicious device, use that opportunity to build teams and as the layers are added, integrate law enforcement and fire to establish teams, ready response teams and even rescue task forces, so if something happens at that incident, you have those things ready. Or even on missing person events. So you have unplanned incidents that move slow enough that you can practice some of these same concepts so again, when the high stress, fast speed event happens, you're already, like you said, you've already normalized those relationships and those team assignments and building your operations from the ground up using these same concepts. Well, this has been a fabulous discussion. I've really enjoyed it this afternoon. Gentlemen, thank you very much for taking the time. Look forward to the next one.